A drive through Europe, moving from Gran Alacant on the Costa Blanca in Spain via the UK to Canada has to begin with good planning. 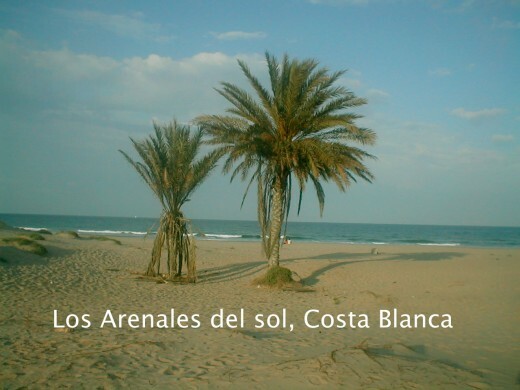 We had just sold our home a top a cliff above Los Arenales del Sol beach and needed to fit luggage for two of us for several weeks to a couple of months, 2 possible seasons, a large dog, his feeding table and our laptop in a 1989 BMW 325i Sport M-Tech. Driving through Europe was something my husband had done many times in his life. I on the other hand have had more experience traveling by air, rail and cruising. As we had just sold our home, the movers had packed up our house and taken crates to the UK for storage ahead of us. To save on travel expense, and the cost of renting a car my husband traded in our left hand drive Peugot for this right hand drive BMW sports car which we would sell at the in the UK before flying to Canada. For my part preparing for the road trip through Europe meant having all the documents, medication, and supplies not only for the two of us but for the dog as well. We had done our research, having traveled with pets before, our dog, Pedro was well documented and innoculated for the drive from Spain through France into Britain and on to Canada. A good handbag which opened wide enough, had compartments for easy access to documents and the like was a must and then came the luggage. 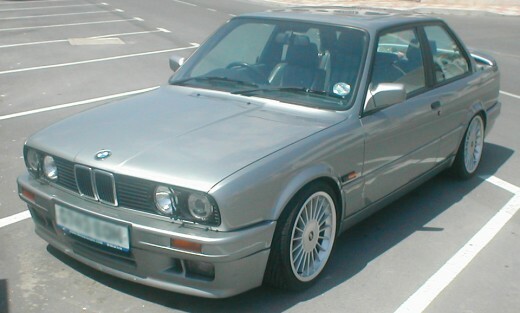 The BMW, although a very cool car, clearly would not hold the two large suitcases, 3 carry-on bags, dog food and feeding table all in the trunk. We didn't want to add a car top carrier, my husband is too much of a poser for that so he came up with plan B. 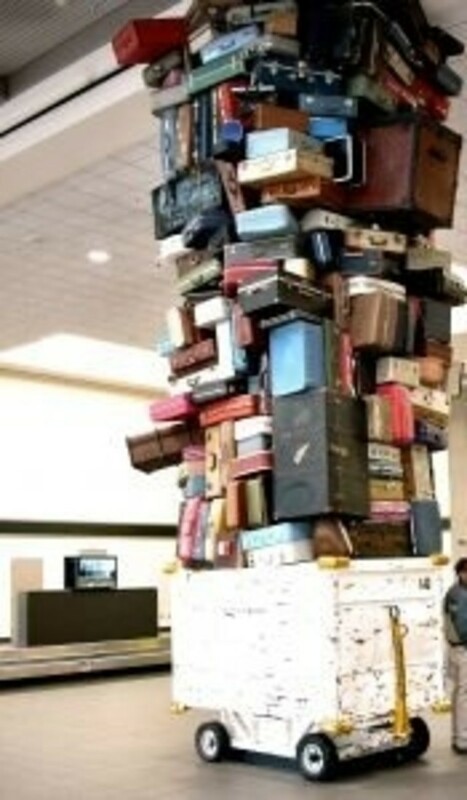 We gave away the large rolling cases, and bought several duffel bags at the local Spanish luggage store. The store clerk thought we were Christmas shopping in June as she'd never seen anyone purchase that many bags at once. The final count was 8 duffel bags in the trunk, on one third of the comfort covered leather back seat, Pedro's feeding table was upside down with his food, water, a bag containing feeding bowls and treats resting in the underside. 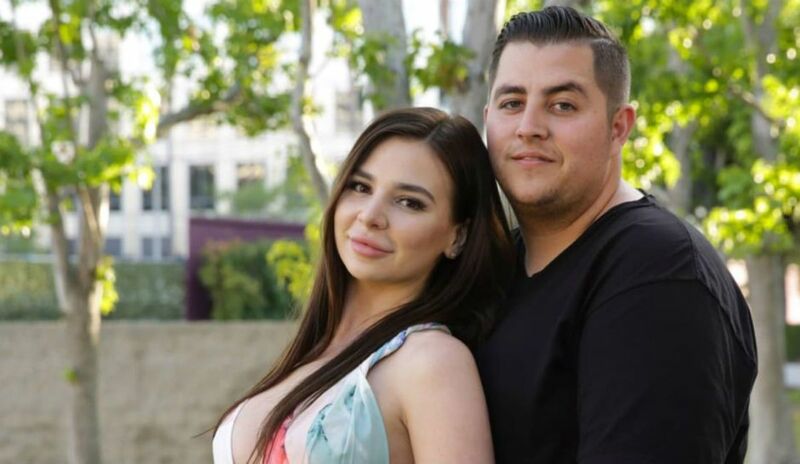 On the floor between the front and back seats was his mattress rolled up in a waterproof bag. All packed in we turned left and began our road trip north through Europe. We learned early travelling with a dog and fitting our stuff in a small car about the sensibility of duffel bags. In addition, making the transition from luggage which fits in a car, surviving many stops to bags which can be moved easily through an airport is an important consideration. Soft with wheels worked for us. Making a sound investment in good luggage, being the world wanderers that we are, our choice is soft-sided leather quality bags which are less likely to be damaged as much by rigorous cargo handling. We are the adventurous children, each one of three in our respective families and none of the other 4 in either family would just pick up and move overseas on a whim as my husband and I have done more than once in our lifetime, even prior to being married to each other. 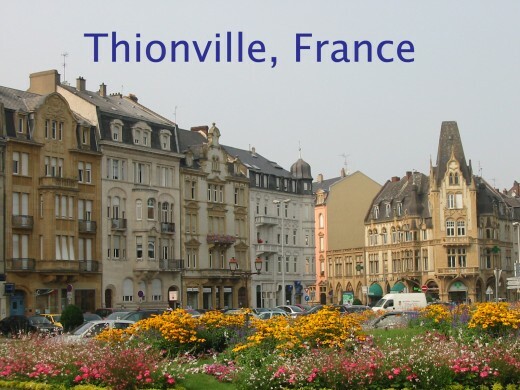 So without a detailed trip tick, as we do, we just decided to head north and see where the road takes us, possibly visiting friends in Luxembourg, Amsterdam, meet up with his brother and wife who were vacationing in Limoges, but a definite stop in Lourdes, France was my one desire. More about this later. We drove along the coast stopping frequently at beach cafes where Pedro could join us on the patio. Dogs are welcomed and even offered bowls of water in many eating establishments in Spain and France. There's always a shady spot on the patio and Pedro is happy to lay under or near the table on the cool concrete between our seats. The first day of our drive through Europe brought us to the popular holiday resort town of Salou, on the Costa Dorada's sun drenched coast. It was no surprise that our hotel had only one room left, as luck would have it, a family room with 4 beds, they accepted pets, so the floor was cushion tiles. It was on the top floor with skylights and dormer windows letting in a welcome cool breeze and you couldn't beat the gorgeous view of the Mediterranean Sea. Sleeping under the stars with the windows open was pure heaven. 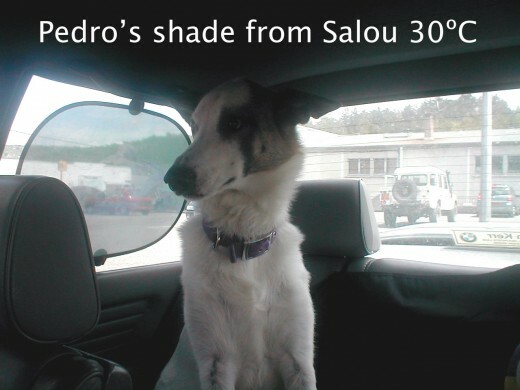 Salou was a scorching 30 degrees Celsius during the day and without air conditioning in our 18-year-old BMW we were concerned about Pedro. Fortunately the well-appointed gift shop in the lobby sold shades for the car and the very helpful shopkeeper pulled them all off the shelf helping me choose those with a picture I liked for my precious pup. 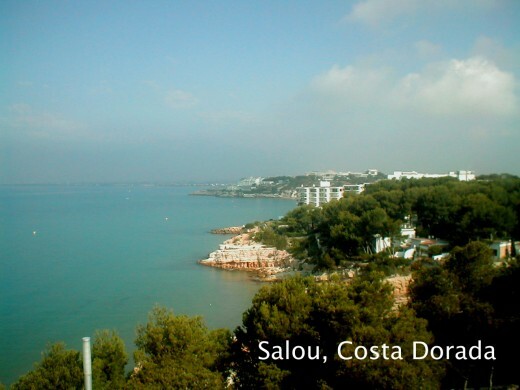 Leaving the gorgeous views of Salou we made our way towards France driving via Barcelona. Coming from a small coastal community with one road up the cliff and another down the other side to the beach, the looming of a large city was immediately apparent in the taste of petrol, and a burning sensation in our nostrils and sinuses. We both agreed this is why, among other reasons our next home would not be in or too close to a large city. We have found over the years that you don't notice the pollution unless you've been living away from it for a good while. Having owned homes in urban areas in the past, short vacations away did not cleanse the system of the city fumes. It was unanimous that we should take the rural routes from here on in. 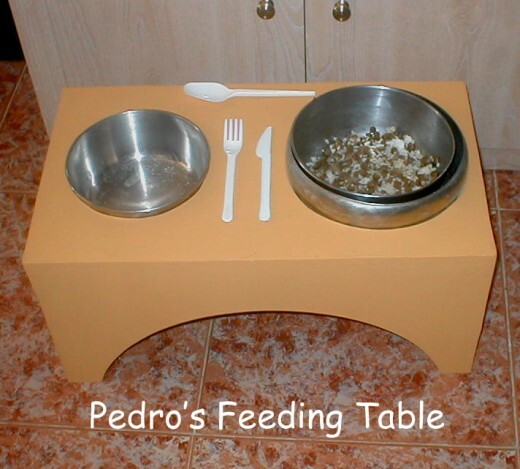 Pedro's feeding bowls and water supply became all important in the heat of Salou and onwards up the Mediterranean coast in the hottest months of summer. As he was on the road, it was important to us that he feel relaxed enough to eat and drink at rest stops with varying time span in between each. He's a noise sensitive dog who won't eat from a clanging noisy bowl which he has to chase around if it slides. The road trip was going beautifully. Pedro has been riding in a car, like his parents, since we adopted him aged 5 months, some 3 years prior to this trip. He rested in the room while we went to eat, was quite calm when we returned to feed him, sans the table, ate and drank well, took to riding in elevators, and walking on a retractable leash seamlessly. Having run free on the beaches in Spain, we were so pleased we had taken the time to buy the retractable leash before the journey to get him used to being tethered. He is such a gentle giant who loves people, cats, beaches, and riding in the car. People in the elevator and the lobby gushed about his sweet temperament and pretty markings. We did not encounter any border checkpoints driving from Spain into France with the friendly European Union. Again Pedro was welcomed with the special affection most of the French seem to have for dogs, inviting him into the dining room in most hotels and even offering bring him bowls of water and food. Even at the highway rest stops they invited him in, gave us a corner table so we wouldn't disturb the other diners and while we enjoyed delicious French cuisine, he just lay under the table peacefully. 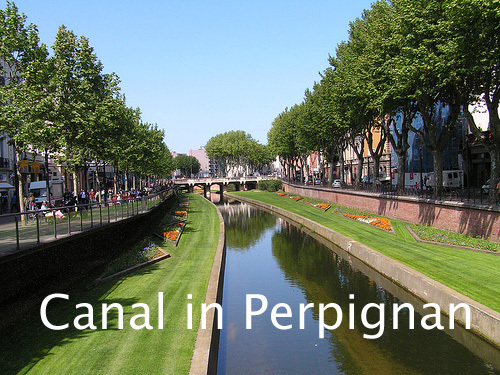 The concierge in Perpignan, booked our next hotel in Agen, in the Lot-et-Garonne region of France not far from Lourdes. 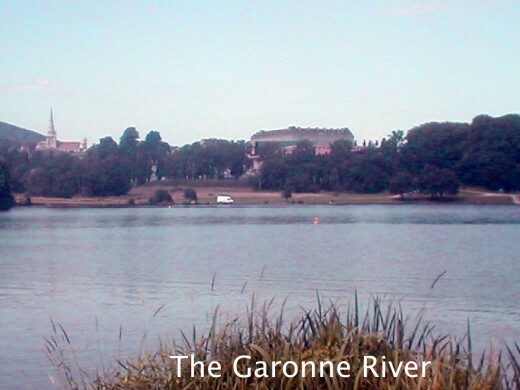 Since our arrival in France, I had been doing all the speaking, not because I am so loquacious or fluent, but studying French in school and some ancestry made me willing to try, unlike my husband, who in addition to being less chatty, lacked confidence in spite of a similar history and a decent vocabulary. So armed with my high school English/French dictionary I forged on to find our hosts throughout the country were enchanted with my efforts inspite of my errors. In hindsight, I should have bought the French Language Lab CD and polished up to a higher fluency. As a child I read about Saint Bernadette who witnessed an apparition of The Virgin Mary in Lourdes. Catholic children read stories of saints lives in order to choose the name of one for their sacrament of Confirmation. I chose Bernadette having been inspired by her story and her faith. 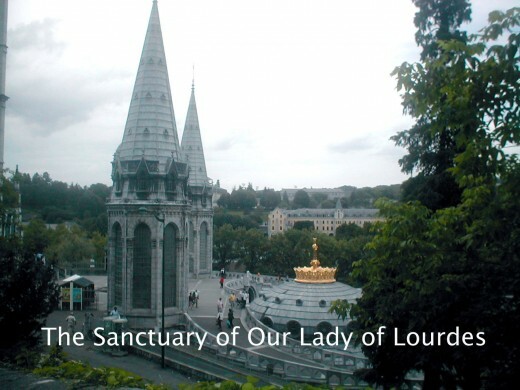 Driving through the town of Lourdes, we followed signs to La Grotte, meaning the grotto, along a winding road lined with tourist shops selling a myriad of religious souvenirs, we arrived at the rear of the sanctuary, found a spot to park and did not realize we were right on top of it. So I walked for an hour onwards up the hill only to return to the car, looking down over the railing I spotted the pathway leading away from the grotto. 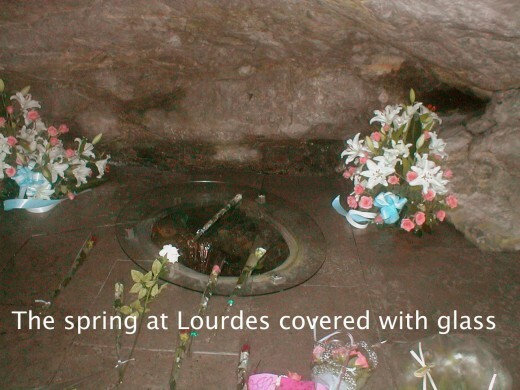 The music from the sanctuary was beautiful and by then Pedro and his dad were out of the car stretching legs, enjoying it, which gave me plenty of time to go down the steps to the grotto, see the spring, say a prayer, light some candles, buy a souvenir and bless it in the holy water. My mum was ecstatic to read my e-mail that evening sharing the journey of faith we began together years ago. Continuing on our drive through Europe from Lourdes to Agen for about 2 1/2 hours along a winding French countryside road. We passed several quaint villages, each one with its own little post office had pretty flowers potted in boxes outside, and houses with wooden shutters open with lovely lace curtains in the windows. It was all so enchanting reminding me of a French painting. Arriving at the hotel just before end of dining hour, we ate, slept rested to our hearts' content. Unlike Salou, where Internet service was only available in the lobby at 6 Euros per hour, here we hired flat rate 5-Euro gadget from the front desk which plugs into any electrical outlet in our room allowing us to catch up with loved ones on the laptop in comfort. Placing the bags in the trunk was becoming an art by this point as I had to have trainers and socks to the front for pit stops with Pedro in case of being led into long grass. Having to haul out all 8 packed choc-a-bloc bags at every stop was not any more appealing than making several trips between the room and the car after check-in to dig out toiletries and clothing change in the parking lot. We needed to see Pedro through the lobby and elevators with as little disruption to hotel guests and staff as possible, and not all hotels had luggage trolleys. I reached a point where I had the toiletries bag, and a one day change for each of us along with the laptop to the fore and we were on a roll. 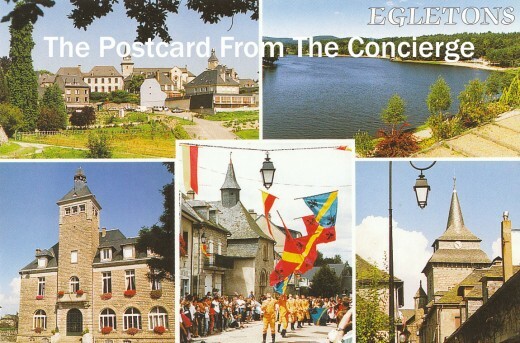 Our road trip through France continued towards Egletons and a hotel built into a hill with the lobby at street level and rooms back and downwards. As there was Equestrian centre next door, we were welcomed by several members cantering their horses over the beautiful grounds. We enjoyed again lovely walks among the trees on the soft French grass through the surrounding fields. Why didn't I take those horseriding lessons my best friend had been offering me for 20 years? Our room had a sliding door out to the grounds which we left slightly a jar to let the breeze in. 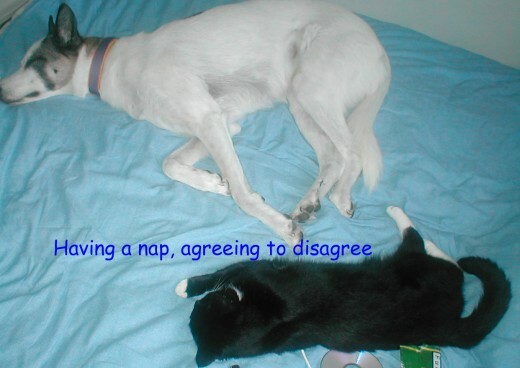 Unfortunately, it also almost let in a little animal with a big loud bang in the middle of the night attracted by our snacks. Pedro, startled, barked with his heckles standing, jumped on to the bed between us and hid for the rest of the night. 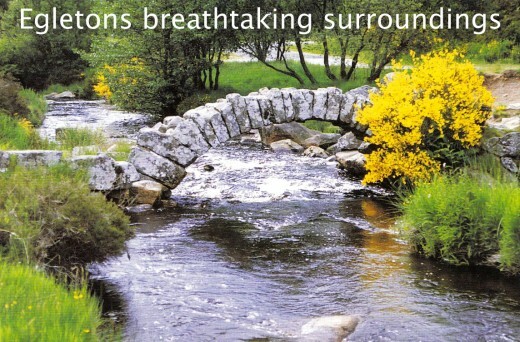 Of all the beautiful little villages I had seen in my travels, Egletons was now my favourite. I found the local church just above the town square, went to Mass and lit a candle while Brian and Pedro sat in the square people watching. We then bought pastries and milk in the only little shop which opens on a Sunday in Egletons. Everyone from hotel staff, village shopkeepers, to bar owners who let me use their loo were so friendly, hospitable and patient with my incorrect French. It was market day and the fresh produce was abundant. Even on a rainy day, which Sunday was, all the villagers turned out to do their marketing. 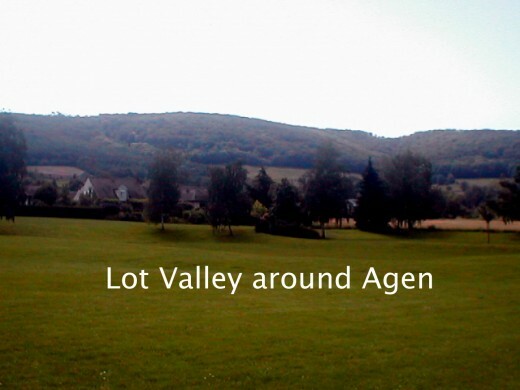 We gushed about our day in the village to the concierge who told us that there are many English residents in Egletons. She then directed us to the local realtor where we found house prices a bit out of our range. My joy at being able to attend mass, having asked her for directions to the church prompted her to buy me this postcard of her beloved village. Such a sweet gesture! 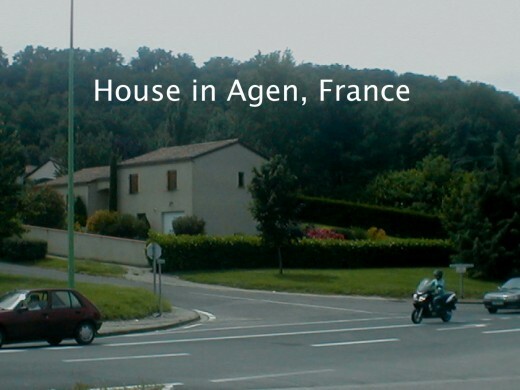 If there was anywhere we would have settled in Europe, it would have been this village in France. Monday morning we checked out proceeding on our adventurous road trip through Europe up towards Luxembourg stopping enroute in Autun. Again a lovely overnight rest stop with excellent cuisine to break the trip up. 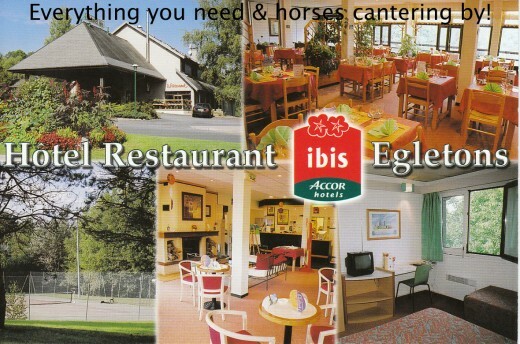 Avoiding the rush of the city, we made our next stop at the Ibis 50km outside of Luxembourg in Thionville, France. We contacted our friends, planned to meet, but alas it was not to be. We had picked up a stomach bug along the way, all three of us. It then rained for the next 3 days and nights. Our room was on the second floor, thankfully near the staircase as we were taking turns going out in the pouring rain with Pedro and his runny tummy every couple of hours, poor pooch! Eventually the sun came out to dry the roads along with all our tummies. The wonderful staff at the Ibis hotel booked our onward reservations in Calais. Sylvianne, the restaurant manager who took a shine to us gaving us excellent service everyday for the 5 meals we had there gave us her colleague, the manager's name in Calais to assist us with sorting Pedro's documentation out. Calais was lovely with lots of fields around the hotel for Pedro, that great French staple, a market, and a sweet vet who came highly recommended. 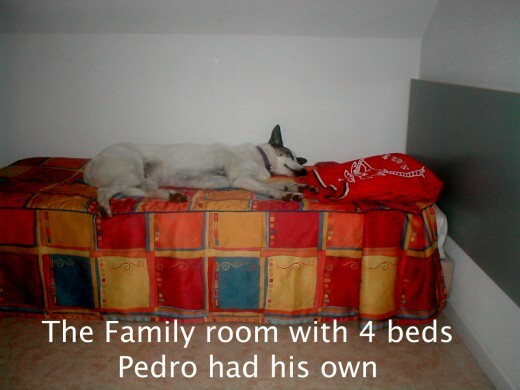 Rightly so as she was 1/4 the price of the others in the area and Pedro liked her. She administered the required worming and flea treatments all at once, gently comforting him during the visit. We were in and out of there quite quickly, stopped to pick up a roasted chicken for lunch in the market situated in the same square as her clinic, and back to the hotel to relax for the next 24 hours until Pedro could leave France. Pedro ate well by now completely over his tummy bug and inspite of the vet visit. 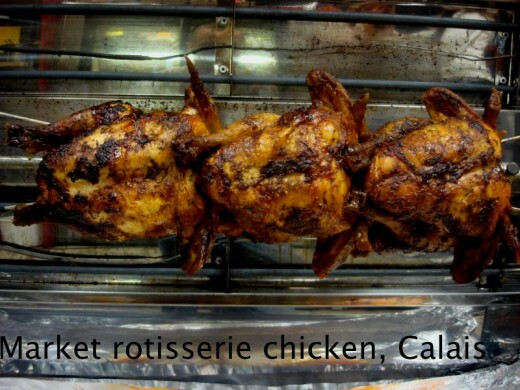 We thoroughly enjoyed our rotisserie chicken too. After leaving town we went to the Euro Tunnel to book our passage for the next morning, stopping first at the Animal Control to make sure all was ok with Pedro's paperwork. They were so helpful and even dialed reservations on their internal speed dial for us to book our passage on the train. Then they explained the next day we'd have to come an hour earlier with Pedro's passport, use the scanner to scan his mircrochip, give our reservation number and then we could proceed on to the train. They even had a fenced gated area for the dogs to use before boarding the train. The train ride was decidedly uneventful which was a mixture of disappointment and relief as I had visions of a JAWS movie with a transparent tunnel under the sea. 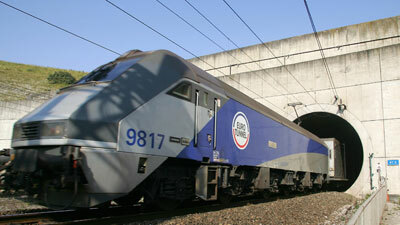 As we approached Folkestone, an announcement reminded us to drive on the left side of the road as we leave the train. 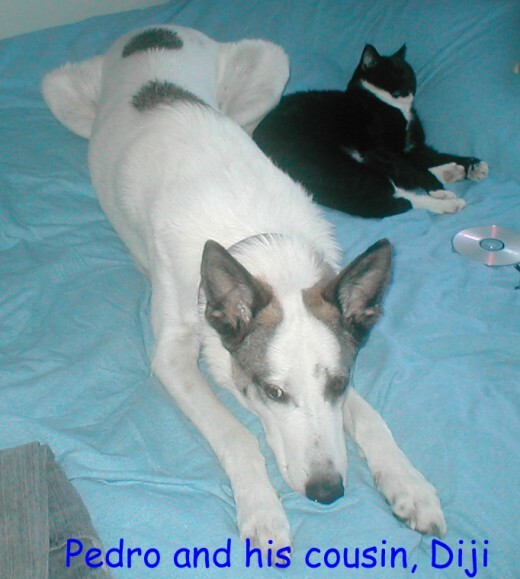 By early afternoon we were happily settled in Surrey with family, Pedro meeting his cousin, the cat, Diji in his usual gentle submissive way. Our drive through Europe in a 1989 BMW 325i sport M-Tech with our large dog, Pedro lasted about three weeks and we loved every minute of it. In the UK there were people lined up to buy the car which we thankfully sold, prior to flying to Canada for twice the amount we paid for it. The profit covered Pedro's fare which was a whopping 4 times the airfare for two of us combined, not that leaving him behind would ever have been an option. He is a blessing for which we are truly grateful. I really enjoyed reading your stories and enjoyed the pictures too.. 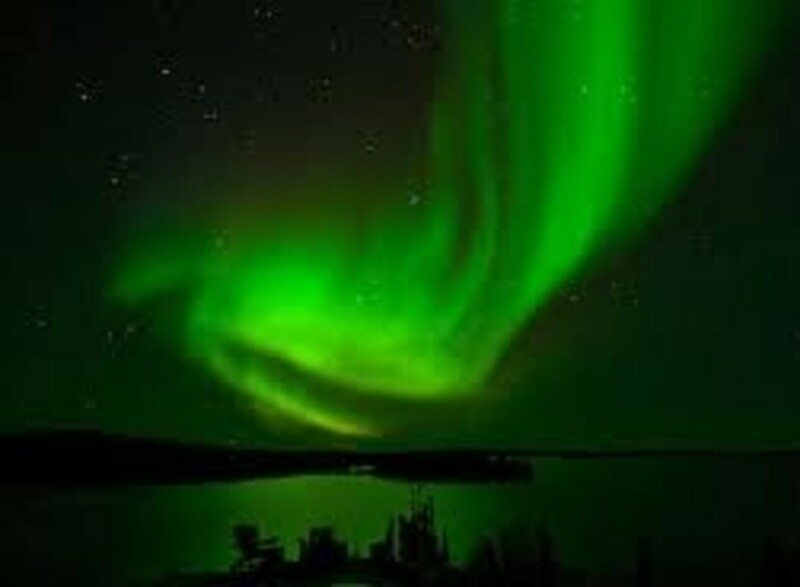 Thanks for all the insights and wealth of information..
https://hubpages.com/hub/VivBountys-Travels, saying I'll leave the RV'ing for retirement. I work online now and hubby is retired so the plan is in the works to do some driving through the US and on down to Florida to put our toes in the sand. Don't have an RV yet, but our SUV served us well for 2 thousand-mile trips last Summer to see family in Ontario, Canada. A great Hub!! We have been full-timing now for almost 9 years (Leah only two), and still haven't seen much of the US, but soon that will all change. Do you have any plans of coming to the US? There is lots to see here!!! Wow TrudyVan, you would have loved the trip. We had such fun. Thank you for rating me up my friend. I have learned something new today.